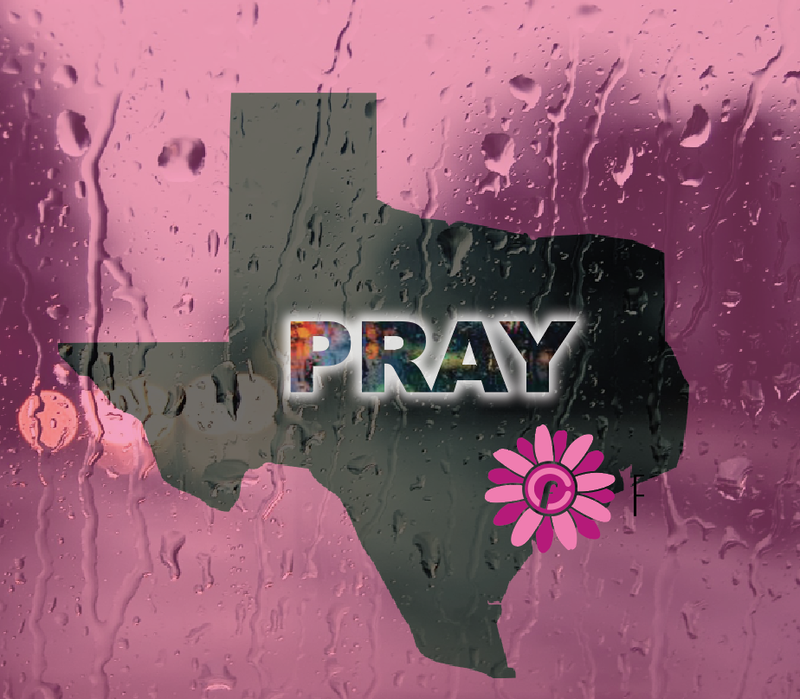 There are no words to express our feelings about what is happening to us here in Texas. The rains continue to fall in Houston, on top of what is already wide spread devastation. From the cities of Port Aransas, Rockport, Corpus Christi, and Victoria all the way to Houston, our state is experiencing what is the worst natural disaster ever to hit Texas and possibly the United States in history. It is being called a 1,000 year flood. Harvey has devastated our Gulf Coast and rains continue to pour. We have so many chicks in these areas, and we just want to let you know we are praying. We are here to support you. We are a sisterhood, and we continue to send our love, thoughts, prayers, and donations to help. We know that so many people will come together in our great state to overcome this tragedy. Many of our trainers have already headed up individual camp efforts to help, so we urge you to get with your local trainer if you'd like to get involved. We will keep you updated on their efforts, and as the rains move out, we will be here praying and helping. Please reach out to us directly, if you are one of our chicks, and in need of support. 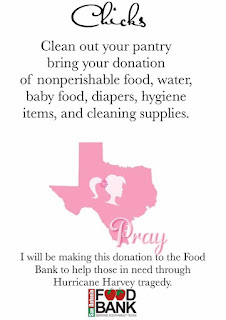 Chicks are asked to bring toiletries, clothing, blankets, and nonperishable food to class this week. Items will be taken to the drop off site at Harley Davidson of Dallas in Allen. 👉This week at all Richardson camps, please bring any of the items below. Trainer Teri will be collecting and making a delivery (or more than one if necessary!) to Network of Community Ministries here in Richardson--an organization that is helping with the Hurricane Harvey relief. Network is a fantastic, trustworthy organization that does amazing work here in Richardson. Haslet Texas Fit Chicks is hosting a Charity Drive for the Hurricane Harvey victims and first responders. 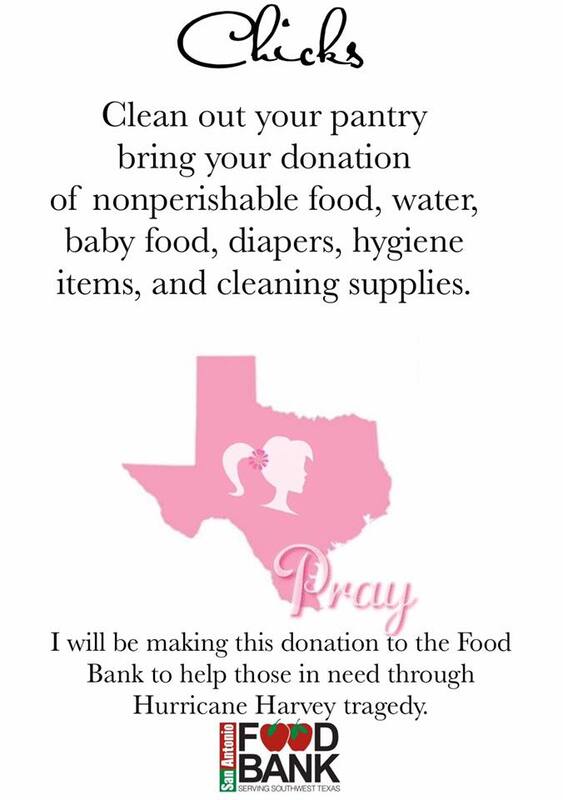 Please bring all of your non perishable donations of: food, clothing, socks, underwear, bras, shoes, toiletries, diapers, baby wipes, formula, baby food, sanitary napkins, blankets, towels etc to bootcamp or my home, and I will personally take everything to the donation center in Dallas. I encourage you to collect from neighbors and friends as well. Thank you and God Bless you! We ask that you only donate new clothing. Especially personal items like underwear and socks and bras. We are told first responders are running out of these essential items as laundry can't be done. FREE SATURDAY WONDER WOMAN CAMPS!! !